When rebuilding starters, the brake system is one of the key elements to making the unit last. However, it is also one of the most neglected parts of the rebuilt starter. I have talked to Rebuilders who complained about the quality of aftermarket brushes, and say they do not last, and are using OEM. This is something very important to remind Rebuilders on how important the braking system is on the starter. Brush wear is minimum when the starter is being used. It is the coasting time to a stop when the most brush wear occurs. This makes it very important to get the starter stopped as quickly as possible to minimize brush wear. I have tried to find out from Delco if there is any published information on the rundown time after bench testing a starter and there doesn’t seem to be any information available. In the 1960s Delco addressed this breaking issue on their 10MT starters by installing a spring on the armature behind the drive assembly. This spring served two functions. First, forcing the armature against the commutator end cap, reducing the coasting time, Second, it also helped the solenoid engage the drive assembly. This is why prior to 1972, most vehicles had 14-gauge wire to the switch terminal of the solenoid. After 1971/1972 we began seeing a 10-gauge wire and the armature drive spring was also removed. Without the armature spring the starter had a longer run down time, causing faster brush wear, shift lever wear and no help to the solenoid to engage the starter drive. Denso, Hitachi, Bosch use a ‘c’ clip or ‘e’ clip on the commutator end to control horizontal armature movement. Allowing faster breaking. which reduced brush wear and shift lever wear, before the design of PMGR (permanet magnet gear reduction) starters. Delco addressed this issue in the SD210 and 260 series starters by using plastic shift lever forks, better brush systems and stronger brush springs. The gear reduction starters are lasting a long time because of almost no run down time, this allowing for hardly any brush wear. It is important to know the difference between OSGR (offset gear reduction) field coil type starters and PMGR starters. The OSGR starters have a longer brush life than the PMGR starters, because as the starter is used, a portion of the current is absorbed through the field coils before it makes it to the positive brush, reducing the arcing of the positive brush. With the PMGR starters the magnets hold the field current all the time. 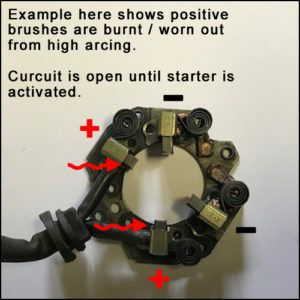 So when the starter is used the current travels straight to the positive brushes allowing for a substantial arcing between the commutator and brush before the starter turns, causing a shorter brush life than the OSGR field coil type starter.